Blueberries are currently being studied because of the great interest generated by anthocyanins due to their potential health benefits due to their antioxidant activity for application in the food industry. In this work the physical and chemical properties of blueberries were studied. The results of antiradical activity were 23.23% in juice and 78.98% inshell; total polyphenol content was 279.17 ± 28 mg GAE/100 mL in juice and 447± 27 mg GAE/100 mL in shell. The values obtained in the microbiological analysis are similar to those obtained in other published works, so the technique allows us to predict the UFCs (Fungi) quite correctly. From the HPLC analysis, it is inferred that the juice of blueberries content the anthocyanins: cyanidin-3-galactoside, peonidin- 3-galactoside and malvinidine-3-glucoside. From the IR and Raman spectra it was found that the following polyphenols predominate: catechin, quercetin, kaempferol, galengina and morina. The "blueberry" is a berry almost spherical, its size can vary between 0.7 to 1.5 cm in diameter, light blue to dark in its interior containing up to 100 small seeds . Since the 19th century the fruit of blueberries has been studied for its qualities for the prevention of urinary infections, water content, quinic acid, malic acid, citric acid, glucose and fructose . In addition, the anti-inflammatory, anti-oxidant and antimicrobial properties due to their high content of polyphenols  adds an additional added value to the final product. Hence the importance of the conservation of the fruit that maintain its functional nutritional characteristics. This fruit is in great demand in several regions of the world, particularly in the USA and Europe. It offers profits above those shed by traditional crops being more profitable than other traditional products (corn, sugar cane) . The province of Tucumán is a major producer of blueberries for export. In the same the plantations extend in about 1,200 ha, which represents 46% of the total area of the country . They lie on the Pedemonte, a transition strip between the western highlands and the depressed eastern lowlands. Planted varieties are mainly O'Neal and Misty. The rest consists of an ensemble made up of other varieties such as Emerald, Jewel, Star, Bluecrisp. The production is made from September, concentrating the maximum in October and to a lesser extent in November. This fruit has more than 80% water content and is a good source of fiber, vitamins and minerals; and various phytochemicals, mainly of phenolic nature, related to different parameters of organoleptic, nutritional and functional quality . It is known that a diet rich in fruits and vegetables improves the general state of health and prevents cardiovascular diseases, neurodegenerative diseases, different types of cancer, etc. . This protective effect seems to be associated to a great extent to the antioxidant capacity of different bioactive compounds, such as vitamin C and phenols, which are capable of preventing or slowing the oxidative processes involved in many pathologies . For marketing CODEX-STAN 103-1981 requires that the product must be free of microorganisms and substances originating from microorganisms in amounts that may constitute a health risk. The Ministry of Agriculture, Livestock and Fisheries in its Quality Protocol establishes as Maturity Requirement differentiated maturity determined by content of sugars minimum 7° Brix, determined refractometrically. It is used in juices, jellies, jams, drinks, etc. This generates a market with a growing demand because they are natural products with an industrial versatility that allows them to compete with other fruit juices . In cranberry juices physical properties such as density, viscosity, refractive index, boiling rise and specific heat are affected by their solid content and temperature. Knowledge of physical properties is needed for the efficient design of food industry equipment, especially those requiring pumping of the product . The viscosity of the blueberry juice is necessary to determine the heat transfer rates, the energy consumption with the increase of the concentration, and to control the temperature and the flows in order to ensure the continuous flow of the product . The main objective of the work is to know the main components of the fruit, to evaluate the effectiveness of conservation methods and the possibility of extracting the feasible components to be used in derived industries, thus giving a greater added value to the local production of the fruit. Antiradical activity was determined in the shell and in the juice of cranberries preserved for 6 months at -18°C. For this purpose, the in vitro bioassay of the radical DPPH (1,1-diphenyl-2-picrylhydrazole) was used as reported in the literature , where radical capture capacity which have different extracts, by determining the degree of discoloration that they cause to an ethanolic solution of the radical. A fresh ethanolic solution of the DPPH radical was prepared by weighing 2 mg of DPPH in a pre-weighed volumetric flask and dissolved in 100 mL of ethanol, reaching a final concentration of 20 mg/L covering the same from light. Ethanolic solutions of the compounds to be tested were prepared at concentrations of 100, 50 and 10 mg/L of both the shell and the juice. The DPPH solutions and ethanolic solutions of the samples and compounds tested were mixed, washed in a 30°C bath for 30 minutes in order to achieve uniform working temperatures after that time was read in a spectrophotometer at 517 nm. Where, Ac is the absorbance of the compound and Ab is the absorbance of the test blank (control). From the percentage of discoloration the free radical scavenging capacity was determined. A value equal to 100 (one hundred) corresponds to the maximum free radical scavenging capacity, while a value close to 0 (zero) indicates a reduced or no capacity. The degree of discoloration indicates the efficiency of the substances extracted as radical scavengers in processes of oxidative stress. As a reference free radical scavenger, quercetin was used as a flavonoid with proven antioxidant activity. For the determination of total polyphenols, the modified micro-method of Folin-Ciocalteu (FC)  was used, which is based on the ability of the polyphenols to react with oxidizing agents. The Folin-Ciocalteu reagent contains molybdate and sodium tungstate, which react with any type of polyphenol, forming phosphomolybdic-phosphotungstic complexes. Electron transfer at basic pH reduces the phosphomonbital-phosphotungstic complexes in oxides, deep blue chromogens, tungsten (W8O23) and molybdenum (Mo8O23), this color being proportional to the number of hydroxyl groups in the molecule. A calibration curve was constructed, using a standard solution of 500 mg/L (concentration) Gallic Acid. To 0.5 mL of a suitable dilution of each 0.3 mg/mL concentration sample, 0.5 mL of the Folin-Ciocalteau reagent was added and gently shaken, after two minutes 0.5 mL of 10% sodium carbonate solution and 3.5 mL of double distilled water. It was brought to the water bath for one hour at 30°C. After the time, measurements were made in the spectrum at 765 nm. The concentration of phenols in the samples was calculated on the basis of the calibration curve and expressed as mg equivalents of Gallic Acid / 100 g of sample. The composition of the anthocyanins from juice extracted from blueberry fruits was determined by waters brand HPLC with UV detector, octadecylsilane (C18) column of 250 mm in length and 4.6 mm in diameter, filled with particles of 5 micrometers in diameter, Using a mobile phase of methanol (60%) and water (40%). Concentrations of 25, 50, 75 and 100% of the juice of whole fruits of blueberries in ethyl alcohol were used. The equipment used was FT IR Nicolet iS50 to determine the Infrared and Raman spectra ThermoScientific DXR Smart Raman. The UV-V spectrum was performed on a HITACHI U-1900 Spectrophotometer of the juices extracted from blueberry fruits, with dilutions in water at 100, 20 and 2% respectively. Table 1 shows the physicochemical and microbiological determinations performed, the instruments and methods used, some of which have already been extensively explained in previous work group publications [13-15]. Others are briefly described below. UV spectroscopy, Raman and IR and HPLC chromatography assays were also performed to identify some major compounds and their composition. Composition anthocyanins HPLC Waters, UV detector, Octadecylsilane (C18) column 250 mm long and 4.6 mm in diameter, filled with 5 micron diameter particles, using a mobile phase of methanol (60%) and water (40%). Table 1: Properties, methods and instruments used. For the different trials, jewell variety blueberries were used from the Oran, Monteros, Tucumán “Tierra de Arándanos”Packing, preserved at -18°C for 180 days. The effect of temperature on density at a constant concentration and the effect of concentration on density at specified temperatures have been studied by [8,9] for various fruit juices (Table 2). Table 2: Density values, viscosity, refractive index, Brix as a function of temperature. In Figures 1-4 the variation of the property in function of temperature. Figure 1: Variation of juice density in function of temperature. Line solid: linear equations, Dot: experimental values. Figure 2: Variation of juice viscosity as a function of temperature. Line solid: linear equations, Dot: experimental values. Figure 3: Variation of the refractive index of the juice as a function of temperature. Line solid: linear equations, Dot: experimental values. 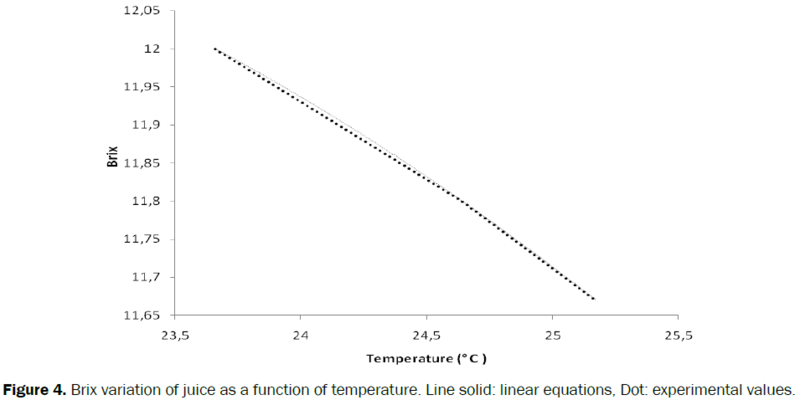 Figure 4: Brix variation of juice as a function of temperature. Line solid: linear equations, Dot: experimental values. In Table 3 we show the linear equations that were adjusted to represent the experimental data with R2. Table 3: Equations of thermophysical properties as a function of temperature for the fruit juice of blueberries. The studied variety presents total polyphenol contents similar to those found in the literature for cultivated blueberries of different origin. USDA Nutrient Database (2004) has published average values of 292.97 mg phenols / 100 g fresh blueberry for the most consumed varieties in the USA. In a paper Ochmian et al. concludes that the phenolic content at best is 231.03 mg total phenols/100 g of fresh blueberry harvested in Poland. Giovanelli et al. has found that the phenolic content values for blueberries harvested in Italy range from 250 to 310 mg phenols/100 g fresh blueberry (Tables 4-6). Table 4: Values of antiradical activity at different concentrations and total content of phenols in the juice and in the husk of blueberries. Table 5: Values of dietary fiber, moisture, ash and CFU of blueberry fruits. Table 6: Total anthocyanin content of blueberry fruits obtained by HPLC. Anthocyanins are characterized by an electron deficiency due to their particular chemical structure. which makes them very reactive to the free radicals present in the body. Consequently they may be potent natural antioxidants . The properties attributed to anthocyanins to improve health are associated with this ability to act as antioxidants and sequester free radicals in biological systems. They can donate hydrogens or electrons to free radicals or trap and displace them in their aromatic structure . The content of anthocyanins obtained with HPLC differ with respect to the data observed in literature . Although maintaining the proportion in which they are found. The predominant anthocyanins being cyanidin-3-galactoside. peonidin-3-galactoside and malvinidine-3-glucoside (Figure 5). Figure 5: Raman spectra of solutions to different % v/v the juice of blueberries in ethanol. 100% continuous line; ... 25%; ---- 50%; and -.-.-. 75%. It is observed in Table 7 in accordance with Figure 5 that infrared spectroscopy shows signals that characterize the presence of aliphatic chain. as well as the presence of carbonyl compounds such as aldehydes, ketones or carboxylic acids in addition to the signal characteristic of the benzene derivatives . Table 7: Frequencies of functional groups in the infrared spectrum/raman of the fruits of blueberries. According to the authors Domingo et al. we observe that the Raman spectrum (Figure 5) would indicate that the peaks 200, 400, 800, 1000, 1100, 1200, 1300 identifies catechin; 800, 900, 1100, 1500 quercetin; 400, 800, 1500, 1600 kaempferol; 500, 600 galengina and 400,1500 morina in the blueberry juice. The polyphenols absorb in the ultraviolet (UV) region. In the case of flavonoid-type phenols there are 2 characteristic absorption bands  the band of the aromatic ring A with a maximum absorption in the range 240-285 nm (benzoyl band) and another band of ring B with maximum of Absorption in the range 300-550 nm (Cinamoil band) (Figure 6). Figure 6: Ultraviolet-visible spectrum of solutions to different % v/v the juice of blueberries in waterl. 100% continuous line;- - - - 20%; and --- 2%. Visible ultraviolet analysis of blueberry juice at 100%, 20%, 2% dilutions in water showed a maximum absorption band (composite structure) between 200 and 300 nm which corresponds to the benzoyl or band II band characteristic. The aromatic ring A of flavonoids with peaks at 384, 366 and 322 nm and another very wide band at 520 nm which is the I band or cinamoil band and corresponds to the aromatic ring B of the flavonoid structure. The displacement of this last band at wavelength greater than 500 nm is characteristic for flavonoids of the anthocyanin group [26-29] thus verifying the presence of anthocyanins in addition to other phenolic substances as shown in Figure 6. The absorption band at 515 nm is characteristic for anthocyanins. In the 0.2% spectrum a peak is clearly seen at 338 nm. In the 2% the band can be clearly seen at 538nm and 475 nm (less intense). At lower dilutions the band of 384 becomes very evident. Figure 7 shows a band fitting that allows to conclude what type of bands are present and how they change with the dilution process. Figure 7: Curve fitting of the Ultraviolet-Visible Spectrum of thejuice of blueberries.■. experimental band; continuous lines. Cumulative Fit Peak; ___ - - -. ...... -.-.-.. ----- and - . - -. bands obtained in the fitting process: 304. 333. 345. 460 and 538 nm. The shell has a greater amount of polyphenols as well as a higher capturing capacity of the DPPH radical compared to the juice. The content of total polyphenols shows values similar to those published in the literature. The values obtained in the microbiological analysis are similar to those obtained in other published works. so the technique allows us to predict the UFCs (Fungi) quite correctly. From the HPLC analysis it is inferred that the juice of blueberries possesses the anthocyanins: cyanidin-3- galactoside. peonidin-3-galactoside and malvinidine-3-glucoside. From the IR and Raman spectra it was found that the following polyphenols predominate: catechin, quercetin. The authors are grateful for the support provided by Consejo de Investigaciones de la Universidad Nacional de Tucumán of Argentina (Project nº 26/E516; 26/E505). Buzeta AC and Berries P. Blueberry. Agroindustrial Department, Chile Foundation, Santiago, Chile. 2000;1997;133. Neri RE, et al. Cranberry juice and its role in urinary tract infections. Ginecol Obstet Mex. 2009;77:512-7. Wei Yuan, et al. Anthocyanins phenolics and antioxidant capacity of Vaccinium L. in Texas, USA. Pharmaceutical Crops. 2011;11-23. No Authors Listed. Back to the future: What awaits the blueberry sector. Global Berry Congress, Unitec. 2016. RivadeneiraI MF and Kirschbaum DS. INTA - National Fruit Program - Cranberry Chain. INTA EEA Famaillá. 2012. Vázquez CS, et al. Functionality of different varieties of arandanos. Csic Sevilla. 2012. Yao LH, et al. Flavonoids in food and their health benefits. Plant Foods Hum Nutr. 2004;59:113-122. Zuritz CA, et al. Density, viscosity and coefficient of thermal expansion of clear grape juice at different soluble solid concentrations and temperatures. Journal of Food Engineering. 2005;71:143-149. De Moura SC, et al. Thermophysical properties of tropical fruit juices. Brazilian Journal of Food Technology. 1998;1:70-76. Nindo CI, et al. Viscosity of blueberry and raspberry juices for processing applications. Journal of Food Engineering. 2005;69:343-350. Tapia A, et al. Free radical scavengers and antioxidants from Baccharisgrisebachii. Journal of Etnopharmacology. 2004;95:155-161. Fabiani GL, et al. Evaluation of the antioxidant content in conventional and supercritical extracts of cranberry (Vacciniumcorymbosum L.). Investigations in Facultadesdel NOA. 2013. Cases AM, et al. Excess molar volume, viscosity and refractive index deviations for mixtures of formamide + some carboxylic acids at several temperatures. Phys Chem Liq.2003;41:503-508. Cases AM, et al. Density, viscosity, and refractive index of formamide, three carboxylic acids, and formamide + carboxylic acid binary mixtures. J Chem Eng Data. 2001;46:712-715. Clará RC, et al. Density, viscosity, refractive index, in the range (283.15 to 353.15)K and Vapor Pressure of α – Pinene, d - Limonene, (∓) - Linalool and Citral over the Pressure Range 1.0kPa - Atmospheric Pressure. J Chem Eng Data. 2009;54:1087-1090. Aguado MA and Ibarz A. Variation of the density of an apple juice with temperature and concentration. Food, Equipment and Technology. 1988;209-216. Bayindirli L. Density and viscosity of grape juice as a function of concentration and temperature. J of Food Preservation. 1993;17147-151. Vanderzant C and Splittstoesser DF. Compendium of methods for the microbiological examination of foods. Third Edit American Public. Health Association, Whashinton D.C., USA. 1992. Ochmian I, et al. Influence of substrate on yield and chemical composition of high bush blueberry fruit cv. Sierra. J Fruit Ornam Plant Res. 2009;17:89-100. Giovanelli G and Buratti S. Comparison of polyphenolic composition and antioxidant activity of wild Italian blueberries and some cultivated varieties. Food Chem. 2009;112:903-908. Bridgers EN, et al. Extraction of anthocyanins from industrial purple-fleshed sweetpota­toes and enzymatic hydrolysis of residues for fermentable sugars. Industrial. en: Crops and Products. 2010;32:613-620. Zapata LM. et al. Optimization of the extraction of anthocyanins from blueberries. Science Docenciatecnol. 2014;49:166-192. García V. et al. Fractionation of the chloroform extract obtained from the inner bark of Tabebuia Rosea (Bertol.) DC. Technological University of Pereira. Junio. 2015. Domingo C, et al. Applications of SERS (Surface-EnhancedRamanScattering) spectroscopy to the detection of natural organic pigments in objects of Cultural Heritage. Plasmónica: Detection on metallic nanostructures. Spanish Society of Optics. Madrid. 2010;2183:197-230. Merken HM and Beecher GR. Measurement of food flavonoids by high-performance liquid chromatography: A Review. J Agric Food Chem. 2000;48:577-599. Hong V and Wrolstad RE. Use of HPLC separation/photodiode array detection for characterization of anthocyanins. J Agric Food Chem. 1990;38:708-715. Robards K and Antolovich M. Analytical chemistry of fruit bioflavonoids. Analyst. 1997;122:11-34. Zielinska M and Michalska A. Microwave-assisted drying of blueberry (Vaccinium corymbosum L.) fruits: Drying kinetics, polyphenols, anthocyanins, antioxidant capacity, colour and texture. Food Chemistry. 2016;212:671-680. Zhao Y. et al. Retention of polyphenols in blueberries (Vaccinium corymbosum) after different cooking methods. using UHPLC–DAD–MS based metabolomics. Journal of Food Composition and Analysis. 2017;56:55-66.